Scott # 881. Light flap bleed. Scott # 891. Flap bleed. Scott # 889. Flap bleed. Scott # 890. Flap bleed. Scott #'s 889-893. Extreme flap bleed. Vertical crease at left. Scott #'s 883 + 879-882. Raised ink cachet. Scott # 865. Flap bleed. Scott # 867. Flap bleed. Scott # 863. Light flap bleed. Crisp. 1940 Famous Inventor Cyrus McCormick - Artcraft. Scott # 872. EXTREME flap bleed. Scott # 901. Flap bleed. Scott # 896. Extreme flap bleed. Scott # 902. Flap bleed. Scott # 895. Extreme flap bleed. 1940 Pan-American Union 50th - Cachet Craft. Scott # 895. Open at left. Looks like "Murray Hart" below illustration. Scott # 894. Flap bleed. 1940 Pony Express 80th - Cachet Craft St. Joseph. Scott # 894. Extreme flap bleed. 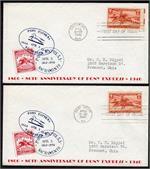 1940 Pony Express 80th - Gilbert Set Of 2 FDOI Cities. Scott # 894. Matched addressee.